With generous community support, SpectorDance has established successful programs including our School, Company, and the Choreographer’s Showcase. All our programs are housed in a state-of-the-art studio and performance venue. THE SCHOOL provide training for all ages and levels of experience in a variety of dance styles in a nurturing environment. SD Youth Company offers committed young dancers opportunities to excel beyond the classroom by performing in underserved areas of our community. 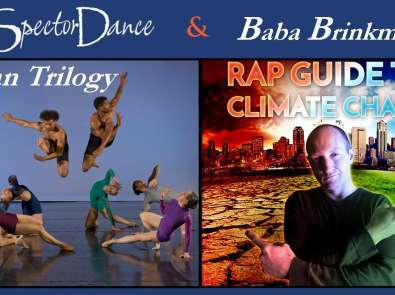 THE COMPANY presents original multidisciplinary performances using a signature style that blends music, spoken word, and visual media with dance. Performance works highlight themes that are relevant to our community. Examples of past projects include Ocean (a collaboration with MBARI), Common Ground (about issues in California agriculture with Spanish/English subtitles based on interviews with farm workers and agricultural experts) and Figures in the Dust, a collaboration with the National Steinbeck Center, inspired by The Grapes of Wrath. Examples of current projects include East West, a collaboration with Rancho Cielo about gang culture, and Ocean Trilogy, a collaboration with MBARI exploring ocean health. CHOREOGRAPHER'S SHOWCASE is a semi-annual performance series featuring guest artists from our region and across the nation.